I’m a UK-based freelance iPhone, iPad, Apple Watch, and Apple TV developer and consultant with experience as a Development Manager in top London web agencies as well as running and selling my own businesses. You can read all about my career in my portfolio or take a look at some of my self published apps. Hopefully on this page you’ll be able to learn more about me than you’d find in any resumé – If you have any questions, feel free to get in touch. I first started dealing with the web back in 1996 at a time when everybody was creating their own little space on the web to promote themselves and their hobbies. You could get everything from Terry Pratchett fan sites to computer game walkthroughs but crucially there was very little actual business. This, of course, quickly changed and the web went through a period of marketing hype before the inevitable burst of the “dot com” bubble. We then had the re-invention of the internet into that awful phrase “web 2.0″ and I watched the focus of the web swing back again to the individuals that make it and again to creating a sense of identity; your own little niche on the information super highway (another great clichéd phrase). This time, rather than learning HTML and trying to decide if a <MARQUEE> tag (yes it was uppercase in those days) is what you need to stand out, we instead witnessed the birth of the “lifestream”; a syndication of our identity on multiple social networks. Whilst I was very fond of this, it soon became overwhelming to "check in" for every interaction in my life (things are going downhill when you need to share exactly what you're eating, drinking, reading, doing, etc). Twitter – The micro-blogging service that is now quintessential for everyone involved with tech. I tend to tweet about iOS development, living as a freelancer, and my video gaming hobby. Whilst you can contact me there, I prefer to receive email for anything that requires more than a few sentences of reply! GitHub – All of the code that I make available publicly can be found on my GitHub page. Take a look at my projects to see some of it in action. 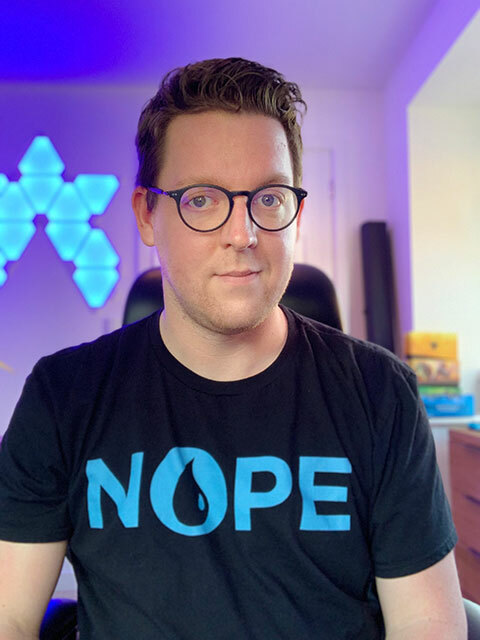 Twitch – I do a fair amount of game streaming over on Twitch mainly focussed on Magic: The Gathering Arena. Please note that I do not maintain a profile on LinkedIn; it's a time consuming spam machine. Instead, you can find my CV and work history on this site. I also do not have a Facebook account (besides a fake one for testing apps) as I fundamentally disagree with the service, their business model, and the effect they have had on society. I sit as a Magistrate in Leicestershire and Rutland. I spend far too much time and money playing Magic The Gathering. I even write daily articles about the game over at ThePlainswalker.com. I play the piano, organ, and sing bass. I also compose my own music (including an hour long opera based on The Fall of Troy). In 2016, Apple updated iOS 10 to require user permission to access the media library after I started a campaign to fix the privacy flaw. I nearly became an Air Traffic Controller in the RAF. I spent 9 months directing a production of Gilbert & Sullivan’s “Iolanthe” at the Northcott Theatre which had a run of 9 performances over 1 week. I ended up studying Politics & Philosophy at Exeter University but was originally meant to do Psychology. On a project I did with some friends at Hack Day London, Yahoo! rewrote their Maps API for us so we could pull more data. When I was around 7 years old, my dream job was to be a croupier. Working Lunch - On the 6th December 2007 I was asked to appear on BBC Television's "Working Lunch" program to talk about error messages on e-commerce websites. I’ve also given them various quotes for later programs including a report on online cashback schemes. The Gadget Show - The team from Channel Five's "The Gadget Show" contacted me in mid-2009 to take part in a program about iPhone app development. The program went out in October 2009 and the app that I built, Social Beacon, reached #4 in the free download charts. You can read all about the development of this project on my weblog. Nonick 012 Conference - In June 2012, my app WallaBee was selected as one of the top European gaming startups and I was invited to the Nonick 012 conference to present it to a panel. Out of the 5 startups, mine was chosen as the "Best European Gaming Startup of 2012" and this is an interview I gave shortly after winning. You can also watch my presentation and Q&A along with an interview I gave during the conference. If you're interested in interviewing me or asking me to speak at a conference, etc, please get in touch. The Checked Shirt - A fortnightly podcast mainly related to freelancing, technology, and Apple. You can get it on iTunes or Overcast, and can follow @thecheckedshirt on Twitter for updates. Connecting to Host - A fortnightly podcast reviewing videogames from a specifically co-operative or multiplayer point of view. You can get it on iTunes, Overcast, or connectingtohost.com and can follow @CTHCast on Twitter for updates. This site was custom designed by me in HTML 5. I didn't bother mocking it up in Photoshop / Sketch as I wanted the site to be all about the text. The font is PT Sans Caption at a standard size of 20px. I don't accept comments on my weblog. If you want to comment, either contact me or write on your own weblog and link to the relevant entry.